Are you tired of turning down high-end, full-color jobs because you don't know how to color separation the image? Are halftones a total mystery to you and you have never used high mesh counts? Do you have an automated color separation program but want to know more about the process? 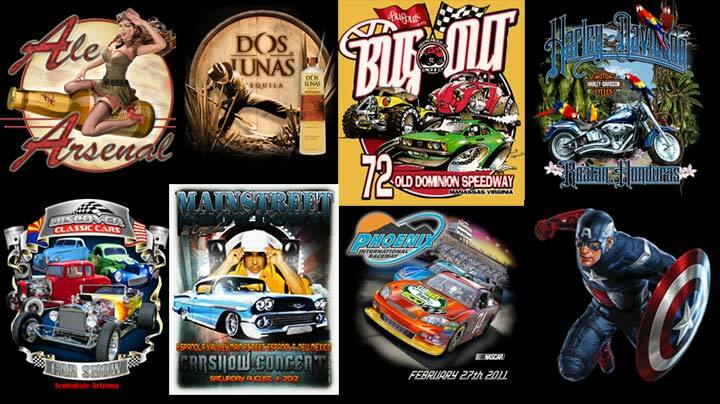 Do you want to take your company to the next level and stop turning down shirt orders from festivals, runs, car shows, events and more? Are you sending out for high-end color separations but want to save money and do them yourself? If you answer yes to any of these questions then this course is just what you need. Signup today for FREE and watch the EIGHT FREE videos from the various lessons. See if you like it and then when you are ready pay for the entire course. This is course is LIVE right now and contains over 11 hours of videos. You can start it and finish it in a couple of days or take your time and complete it at your leisure. Refer back to the lessons as often as you need over the next TWO YEARS! Important Note: If you take this course you get complete Photoshop training and you do NOT need to also take the Photoshop Master Class. 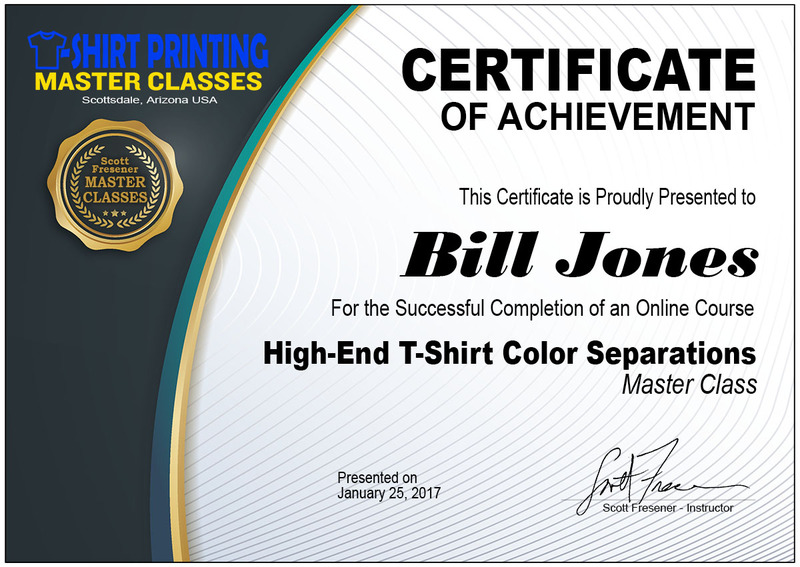 In this Master Class you will learn all about creating high-end color separations for light and dark shirt T-Shirt screen printing using Adobe Photoshop. 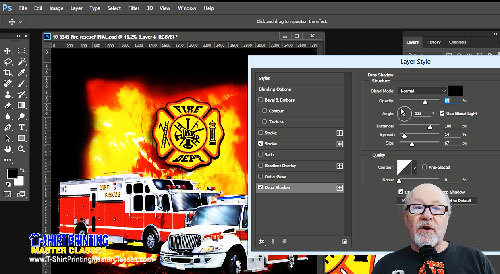 If you are new to Photoshop you will learn all the basic and advanced techniques you need to know to become a Master Color Separator. At the end of the course you will received a Certifcate of Achievement. This course is taught by industry guru/veteran, Scott Fresener who has done tens of thousands of color separations for large and small companies around the world. Shirts printed with Scott's seps are in most major department stores, theme parks, airport gift shops all the way to small town teams and events. Scott has pretty much taught the industry how to separate - starting off years ago teaching how to separate using a process camera! Start taking the course today and finish at your own pace. Refer back to the lessons and videos over and over for up to one year! You can even take the courses on your tablet or smartphone. You can take our courses with confidence. We want you to be happy and are offering a 30 Day Money Back Guarantee - no questions asked. Simply email a request to scott@tbiznetwork.com within 30 days of registering for a class and request a refund. You will have it within 48 hours during normal business hours. Easy! To see a more in-depth course detail look at the lengthy Course Curriculum on the left. There are over 65 short videos, mini-manuals to go with key sections, quizzes, the ability to upload files for Scott's evalation and critique, plus the ability to ask questions at anytime. In a nutshell you will learn all of the following. How to use Adobe Photoshop. How to create Simulated Process Separations. How to create Index Color Separations. How to create CMYK Process Color Separations. How to create Black and White and Old Photo Separations. All about how to use your inks correctly. Proper screen making for high-end printing. Proper press setup and printing techniques. Tips, tricks and techniques that Scott uses every day. Over ELEVEN HOURS of video instruction. Mini-Manual PDF files for easy reference. Download work files so you can follow along with Scott. Take Quizzes at each important session section. If you want to do separations for images like these - this course is for you! Pretty much None. You just need to have a desire and hopefully a need to use high-end color separations for garment screen printing. You will need a copy of Adobe Photoshop - any version - on a Mac or PC. Owner/operators wanting to know the process or how to do it themselves. Artists wanting to learn how to create high-end separations. Artists who already do this but want to know more and learn tips and tricks to speed up the process. Printers or artists using automated programs like T-Seps, Separation Studio, Easy Art and others who want to learn how to get more from those programs and learn all the tweaks that make good separations great separations. The courses are like having Scott Fresener watching over you and teaching you. Most of the videos are shot like "gamer" videos with Scott talking to you in the lower corner of your screen. Plus you get dozens of work files and mini-manuals to use in the course. See for yourself before you even spend money. Signup for free and check out some of the FREE content. Not at all. You will learn Photoshop from this course. What if I only use Corel Draw or Adobe Illustrator? You will need to break down and get Photoshop. The Creative Cloud is an excellent way to get it and you can get a 30 day free trial if you need. Any version will work - Mac or PC! What if I only have a four color printing press? That makes it a little hard. Most dark shirt high-end images have an underbase white and then the colors and they are generally six colors or even more. A six color press is common and a minimum for high-end printing. What Will it be like AFTER the Course? If you complete the entire course and master all (or most) of the important steps and concepts then you will be shocked and how much simpler and better things are. You will be able to take in any job - from a customer's cell phone picture (ok, the quality does have a bearing on the outcome), a low quality JPG image, jobs created in most other graphic programs - and be able to do the color separations for light and dark shirts in a short time. Some jobs might take 15 minutes and other more complex jobs could take an hour or so. But, the real payoff will be confidence - and that will show in your work and when out selling. You will find that high-end jobs lead to other high-end jobs and the ability to control the separations will take your business to a new level. Even for jobs that do NOT require separations (DTG, Sublimation, Posters) - you will know your way around Photoshop and be able to fix bad artwork, build great looking designs, improve images from customers and feel very confident with your computer graphics abilities. And, if you are new to using high mesh counts and halftone dots, your screen making ability will go through the roof. Your prints will be much better and softer and technically you will be a much better printer. This class is LIVE right now. Start taking it today and finish at your own pace. Refer back to the lessons and videos over and over for up to TWO YEARS! All sample designs shown or used in class exercises are copyright and/or trademark of their respective owners. Course cirriculum is subject to change without notice. Scott currently does hands-on classes with his son Mike Fresener at the www.PrintersBootCamp.com and in his spare time he plays Bass and Keyboards on and off with classic rock bands in the Phoenix, Arizona. This class will make photoshop your friend! I always wanted to understand what was going on in T-Seps. It's great that separates automatically and does a great job, but if the artwork was really bad and T-Seps was having trouble, we were stuck. It was like I could only use the tool in the best case scenario. I just didn't have the experience in photoshop to get my arms around the beast. I tried all of the tutorials on photoshop, but they were geared towards paper and photos. The ones that did talk about seperations were from someone that came from another planet. Before I took the course I asked Scott will this course explain what is going on in T-Seps. The answer was yes. After completing the course I now feel as comfortable in photoshop as I do in illustrator. Scott does a great job explaining the steps from a screen printers view. It's also great that when I can't remember that one step, I can go back to the course and get the answer. 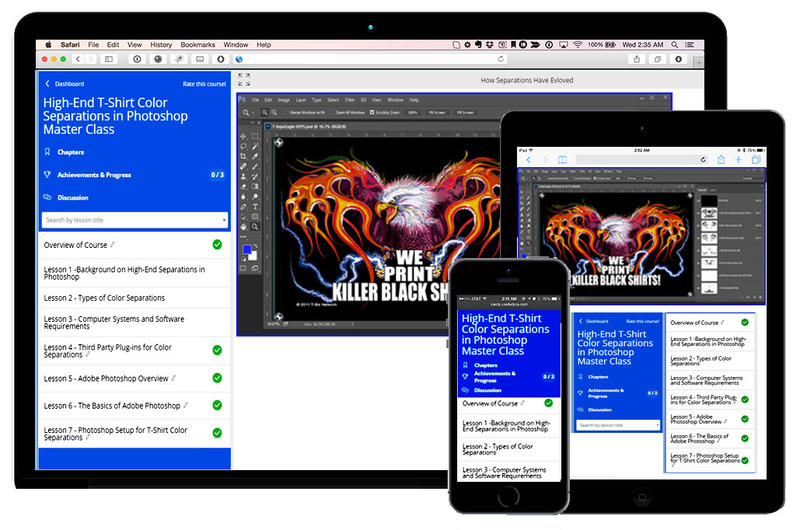 If you are a screen printer and want to KNOW photoshop, this is the course. Thanks Scott. Garett. This course was amazing! I am new to screen printing and this course has helped me understand alot. Thank you. The videos were very very precise and clear on every bit of training. explanations were very easy to understand. links allow to go back to sessions for a refresher and lots of downloads available to practice on.love the quizzes at the end of each topic to make sure its all been fully understood. ive learnt a great deal with all the different ways of doing separations.exactly what I wanted. This course is unbelievable and we are definitely seeing a noticeable difference in our photorealistic seps. Based upon the results of taking this course we are now making preparations to introduce our pre-printed line within our community. You nailed it with the materials covered here. Thank you. Thanks so much Scott for creating and providing this course for new separators. I've watch so many Youtube videos trying to learn seps and they just don't teach everything you really need to know to become a good separator. Scott teaches just like a seasoned college professor. I was able to grasp the seps process and understand everything easily from his videos. I love that the same files in the videos are provided for the practice and follow along. Thanks again Scott! Best course for color separations!!! This course gives you a complete overview of how to do color separations, different types of separations, and a thorough understanding of how to use the tools. it also gives you a good look at what industry standards have become and what to look out for in terms quality control at press. This is extremely useful and should be compounded into a video book, as i constantly reference lessons for assistance. Really enjoyed taking on this class. I felt that it was very informative and easy to follow (I still need some practice though! 😉). Scott has been a great help with the critiques and at explaining how or what could be done instead. Would gladly take another online course through him and T-biz Networks. Thanks.